SOUTH WODEN parishioners are delighted with their recently completed renovation and extension works next door to its Sacred Heart Church in Pearce. After 12 months of scenes befitting those of a home makeover show, the precinct now boasts a brand new office and hall. The garden and surrounding area is also bursting with new life thanks to the addition of some new plants and lighting, while the parish has extended its carpark space with easy accessibility for those less-mobile parishioners being the main practical feature. Speaking on behalf of the parish, Secretary Megan Loughlin, described the new space as “wonderful”, saying that it really connects the office with parish life. “I get to see and talk with a lot more parishioners now the office is attached to the parish hall,” she said. “It is great to be out of the presbytery because it now allows [parish priest] Fr Richard [Thompson] to differentiate between parish and personal time. Fr Thompson is also pleased to have everything completed after a year being in construction mode. He too has welcomed the changed surrounds. “We had a working-bee recently where we planted Mary MacKillop Bottle-brush trees on the grounds,” he said. “We also planted 100 Rosemary bushes to mark 100 years since the end of World War I. The parish, along with Sacred Heart Primary School, has applied for a Department of Veteran’s Affairs grant for this part of the project. “Hopefully we can recover some funds to install a flagpole, memorial plaque and lighting,” Fr Thompson said. 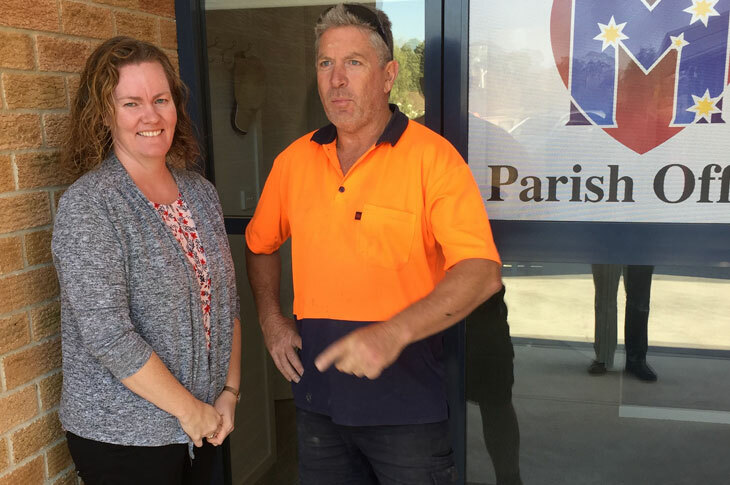 Parishioners, Matthew and Belinda Doherty of Matthew Homes, were given the building contract for the parish’s renovation and extension works. They said it was a nice to have left their mark on a place which has been a part of their family for decades. “My family were here when the parish first opened 42 years ago,” Mr Doherty said. “We have practically spent our whole lives around this parish going to Mass and being involved with Antioch Youth Group among other things. Matthew Homes was also contracted to refurbish Archbishop’s House on Commonwealth Avenue in 2012. The South Woden Parish celebrates its patronal feast of Mary Help of Christians on May 24.